1-CD Digipak (4-plated) with 31-page booklet, 34 tracks. Playing time approx. 85 mns. Klaus Gisha: "I have never experienced, in the 16 years of the Gisha Brothers' existence, that any of us could not play because of drunkenness." In contrast to the competition from Fats & His Cats, in which Otto Ortwein only really gets started after consuming half a bottle of brandy, the Gisha Brothers decide: alcohol only after the performance. Maybe that's why everything turns out to be a little milder, more sedate and more groomed for them. It starts with the neat clothes - the trousers freshly ironed, the shawl collar jackets freshly brushed and the shoes freshly polished. This may also have something to do with her life story, but it will come later. Moreover, the music has a slightly different tone than the other raucous people. Obviously, however, there's a not entirely wrong insight: "When we work, we can only play 100% if we're not drunk." That's how they keep it - almost always. Kurt Rast: "Well, Hans Gisha liked to have a cognac in the afternoon. They didn't call him 'Hans the Cheap' for nothing." Hans was the most important man among the Gishas, because he booked the jobs, he paid the salary, and he determined how to behave. When Bernhard 'Micky' Mikulski (†) discovered the Gisha Brothers at Maxim in Frankfurt in 1962 for the recently founded German offshoot of the American CBS, they had long since turned their backs on jazz and, after a rock 'n' roll phase, turned to the newer musical twist and slop fashions. Mikulski brings the presenter Hans Verres (†) from Hessischer Rundfunk with him to confirm his verdict, and when he - bewitched by the music of the Gisha Brothers - raises his thumb, nothing stands in the way of a record career. 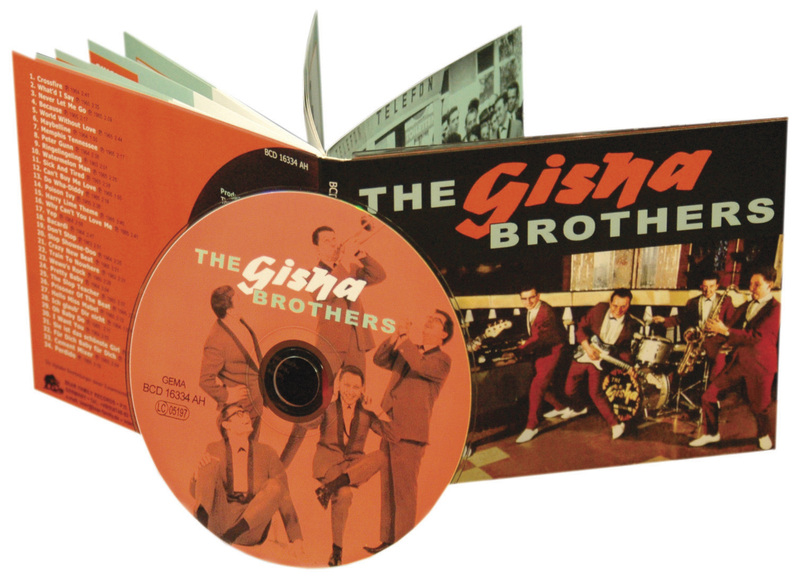 In October 1963, the Gisha Brothers moved into Studio Pfalzgraf in Walldorf to record 12 titles, some of which were surprisingly original compositions. Already in December the first single comes on the market: Don't Stop/Train To Nowhere. It sells quite well, especially in the Frankfurt area, where the Gisha Brothers are one of the best-known bands after countless appearances in clubs and dance halls. "We've often played door-to-door with the Indonesians, with the Tielman Brothers for example." Shortly after the turn of the year, the CBS is already pushing the second single: Ringelingeling/The Slop Teacher. After the record in the Schlagerbörse at the Hessischer Rundfunk (moderated by Hans Verres, such a coincidence!) became monthly winner, the sales skyrocketed. The CBS hastily releases the 12 pieces from the Pfalzgraf sessions as LP. The band swims fully on the slop wave, and this is also reflected in the LP title. The cover of the album is made at a gravel pit in Neu-Isenburg. With 50 marks from the CBS box office, the locomotive driver of the Kiesgrubenisenbahn is beguiled to clean his old narrow-gauge locomotive so that it does not harm the bright red suits of the musicians. So you pose in the finest stage outfit on the probably never again so polished locomotive: The Slop Train. The album corresponds to the program of the band at that time. Most of the recordings are instrumental numbers like Crossfire, Yep or Peter Gunn - all a little smoother than known from the original, but not without appeal and occasionally with idiosyncratic arrangements. But there are also tracks like Blue Guitar and Bacardi that seem strangely antiquated to us today. 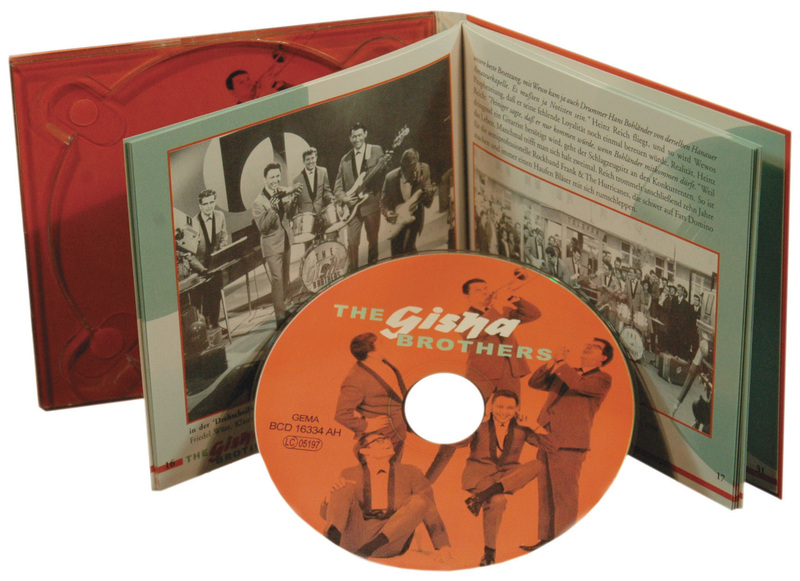 The successful sale of the records brought the Gishas to the attention of television, and in March 1964 they appeared as guests on ZDF's 'Schlager des Monats' programme. Over the next three years, the Gisha Brothers have been on the road again and again, twice on 'Drehscheibe' (ZDF), in 'Musik aus Studio B' (ARD), in 'Prisma des Westens' (WDR), but also on Swiss television and Austrian ORF. In '30 minutes' at Düsseldorf Airport, they will have the opportunity to present themselves in more detail to a television audience. The Gisha Brothers hit single Ringelingeling is an original composition by Hans Gisha, although his brother Klaus, born on 21 July 1928 in Silesia, is the actual musical head of the group. The parents are Martha and Hans Giža, professor of music, active as music teachers, orchestra and choir conductors. After the annexation of Poland by National Socialist Germany, the name was changed to Gisha. Klaus and his brother Hans, three years his senior, receive top-quality musical education in their home musical household, and both will later begin successful music studies. In 1938 his father was appointed music school director and city orchestra director in Ohlau near Breslau. Shortly afterwards, a former private from Braunau decides to cover the world with blood and tears. As a result of the Second World War and the approaching Soviet army, the Gishas had to flee Silesia in autumn 1944 and went to Marienbad. Here it comes - thanks to the unsurpassed contempt for humanity of the mad dictator - to the first 'professional engagement' of the young Klaus Gisha. At the age of 16 he is to be drafted into the Volkssturm to stand in the way of the Russian tank units as a human brake block. Through the mediation of a former pupil of his father, however, Klaus was given a place in the SA music train 'Standarte Feldherrnhalle', which was moved from Berlin to Prague to a remote school as the Red Army approached. There one receives the news of Hitler's suicide, and the conductor quickly orders that the musicians should play a mourning parade for the 'fallen leader'. Klaus Gisha: "We were scared to death." In order not to fall into the hands of the Russians, the entire music corps goes to Pilsen. Near the village of Wiesengrund he was captured by the Americans, but deported to Silesia to the Russians, who in turn handed him over to the Czechs as a forced laborer, which resulted in 18 months of forced labor on a farm. The parents are meanwhile back in Ohlau, take the Polish citizenship and the old name again. Back in his home town, however, the young Klaus Gisha refuses to become a Pole and is therefore expelled to the Soviet occupation zone. There he meets his brother Hans again in Freyburg an der Unstrut. With the two brothers joining the Salonorchester Kurt Ruppe as alto saxophonists and trombonists respectively, the commercial career of the Gisha Brothers as professional musicians soon began. The salon orchestra plays in the best hotel in Bad Kösen, which is soon closed by the socialist rulers: "At last the last restaurant of the upper ten thousand has been brought to the people", cheer the socialist cadres, and Klaus and Hans are once again unemployed. One finds work in changing orchestras, but on the occasion of the golden wedding of the grandparents in Saarbrücken Klaus leaves the dust. In Zweibrücken he plays in various bands for the American occupation soldiers. In 1953 Klaus moves to Hanau, where he also smuggles his brother Hans because of the rich offers for professional musicians. So they offer the astonished German audience and the majority of US soldiers American-influenced dance music in such well-known shops as 'Stadt Wien' in Sternstraße or 'Zum Treffpunkt Stolzenfels' in Dettingstraße as well as in American army clubs like 'Roseland-Club', 'Rainbow Club', 'Skyline Club', 'Topper Club' or 'Pioneer Club'. With their engagement at the 'City Bar' in Hanau in June 1955, Hans (trombone) and Klaus (clarinet and saxophone) joined the front row and now call the band The Gisha Brothers. Cool jazz is hard to come by, and soon you'll be jazzing in the well-known Frankfurt shops like 'La Paloma', 'Conco Bar', 'Fischer-Stube', 'Swing Bar' and 'Dolly Bar'. This is the scene that musicians such as Albert Mangelsdorff, Joe Klimm and Hans Koller are playing in Frankfurt's 'Jazzkeller'. The Gisha Brothers part includes changing musicians such as Gerd Kloft (†; piano), Alfred Bruder (†; piano), Roland Fritsche (piano), Heinz Schönberger (†; clarinet), and 'Raffi' Lüderitz (drums). When in 1957 the group Klaus Gisha (clarinet, saxophone), Hans Gisha (†; trombone), Friedel Wüst (†; piano), Werner Wischert (†; trumpet) and Horst Schulze (†; drums) got together, they quickly switched to Dixieland because they could earn money with it. But soon there is no stopping in Germany: Elvis has to go on stage - and if not in the flesh, then at least as an imitation. And especially in the Rhine-Main region, where 20,000 Americans dominate the nightlife in Frankfurt alone. These GIs naturally want to dance to their music, and so the Gisha Brothers can't help but adapt. Klaus Gisha: "Hans was responsible for the texts. He had a number of American friends who not only brought the latest records by, but also had to listen to the lyrics of the records. I worked out the arrangements." But first a Rock 'n' Roll compatible team had to be brought to the start. So at the end of 1959 Klaus 'Muckel' Gisha goes on a search for suitable drivers. The pianist Friedel 'Jakob' Wüst wants to join the sound wallpaper change, and brother Hans 'Pluto' Gisha grabs the electric bass. Heinz Schmidt (drums) should provide the right rhythm. Kurt Rast: "When they asked me if I would play with them in 1960, there were only four of them - still without guitarists." Only with Rast does the line-up become complete, and as a quintet the new rock 'n' roll vocals go better: "The warden threw a party in the county jail, the prison band was there and they began to wail...". Kurt Rast: "I was sitting in the Allgäu and saw an ad in the 'Artist', I signed up for it. The pianist Hermann Griesfeller hired me for his band The Blue Diamonds. He was looking for musicians to perform in clubs in France." Actually Rast is a trumpeter, but because the demand for this instrument is low due to the new light music, he has autodidactically turned into a guitarist. And as such he goes with The Blue Diamonds to France, where probably nobody suspects anything of a Dutch duo with the same name. Kurt Rast: "When President de Gaulle decided to throw the Americans out of France, the engagements in the clubs there were over for us. Griesfeller came from Hanau, so we moved on. And in Hanau the devil was loose - at every corner a pub with music. I was also told right away: 'Go over to the Jolly Bar, there's a great band playing'." The Tielman Brothers. Heinz 'Bimbo' Reich: "I played with The Rock-Cats, a rock 'n' roll band from Hanau, where Wolf-Werner 'Wewo' Peiniger also played. We always had engagements on Fridays, Saturdays and Sundays in shops like the 'Bernardseck'. When we were playing in the 'City-Bar' Klaus Gisha showed up and recruited me to the Gisha Brothers because they were looking for a drummer. I was thinking a little, and then I said yes. The wewo has given me on the way: 'You'll regret this!'" A Hans Bohländer (†) comes as a replacement for the Rock-Cats now renamed Hit-Cats. Heinz Reich: "I told Wewo to be glad that the Bohländer was better than me." Klaus Gisha: "Hans Bohländer could play by notes, but the better beat drummer was Heinz Reich." The new, rocking Gisha Brothers quickly establish themselves in the forefront of the Rhine-Main area due to their skills, and so it is understandable that Bernhard Mikulski wants to have the Gisha Brothers on his label as well as Fats & His Cats. Their specialty is instrumental music, due to the trained musicians. The two Gishas, Wüst and also Rast know how to play from the sheet. And what their contemporaries have ahead of them in terms of power, drive and soul, they make up for with technical perfection. They are considered to be rock 'n' rollers for the moderate clientele, not for the half-baked; their performances, peppered with show interludes in which they try their hand at comedy, are always of a precision and elegance that make some competitors pale with envy. There's hardly any wrong sound coming out of your amplifier or your lips. 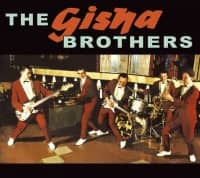 After coming from rock 'n' roll to twist and slop, the Gisha Brothers have to readjust with the advent of Beatlemania, and they do it with their own professionalism. What the audience wants is offered. They refuse the mushroom head hairstyles, but the "Yeah! Yeah! Yeah!" they're crying too. Their strength, however, lies in American instrumental pieces such as those from The Ventures, The Astronauts, Duane Eddy or Boots Randolph sloshed across the pond. Here they have found a niche in which they feel comfortable, as they can make full use of their technical abilities. Kurt Rast: "Being a musician back then was a great job - four hours of work and the rest of the day free. You were well paid, too." That may be a little euphemistic, but the stuff was lucrative. Performances were well remunerated, and so the son of a country court president, making music, earned more than his father. There is not much to be earned on the records themselves, the contracts are too exploitative for that, but they mean additional reputation which can be positively brought into the negotiations for engagements. There the fee rises then. The record releases of the Gisha Brothers also generate not only lucrative domestic engagements, but also a reputation from (conservative) foreign countries: Austria and Switzerland. Kurt Rast: "It was supposed to go abroad, and I didn't want to go with it. I was newlyweds, and there was a just born son. I didn't want to jeopardize the family because of the music. So I said, "No, without me." Another version of this story is that he was fired by Hans Gisha, who represents the business side of the Gisha Brothers, because he claimed a special status. Kurt Rast joins the Taifuns, founded by Hans Ludwig (vocals and bass) and Friedel Berg (saxophone). Peter Bischoff (drums) and Rudi 'Ikke' Neumann (rhythm guitar) complete the quintet: another Schalkragenbrand, which will cover the Rhein-Main area with saxophone-heavy sound, even though Rast attributes more substance to Dixieland-Jazz today: "The whole bands in the 60s, that was just scrambling. It wasn't worth anything." The Gisha Brothers engage Ewald 'Waldi' Bayer (†) from the Hanau rock band The Bluebells, and with it they fork out one of the best guitarists far and wide - one of the Amorada or Delicado who blindly puts him on stage at a crazy speed. Bayer also comes from a household of musicians, and he first learned to play the piano from his father's boyfriend. One day the boyfriend came and told the father, "Your son's playing money out of your pocket." - "Why?" - "Yes, he's not practicing!" Consequently, father Bayer, who owned, among other things, a music shop, found that the piano was either practiced or locked. Son Ewald replies that he could do it quietly, he didn't want to learn piano anyway, but guitar. This remark leads to the remark "piano, nothing else" - and this in turn leads to a closed piano. Now son Ewald goes to the local gas station to hire as a car washer, and when he has the money, he goes to the competition to buy a guitar. Father's almost freaking out. Werner Bayer: "But my brother practiced like mad. He played in a band until one o'clock in the morning, then came home, and practiced in our room until five o'clock. Meanwhile I lay in bed and slept. We had to share a room." As a member of the Gisha Brothers, Bayer now has the good fortune to do most of his TV appearances with the band, although he only stays with them for three quarters of a year because - according to the official version - he is supposed to take over father's watchmaking and jewellery business. One hears again and again, however, that he cannot get along with Hans Gisha and that this is the reason for his departure. Werner Bayer: "That's quite possible, because my brother was a difficult character." As a replacement for Bayer, the young 'Wewo' Peiniger (†) comes to take over the six strings. And now they've got the dirty beatdrive on them too. From "one - two - three" on their second LP 'Happy Thunder' is a completely different, stronger Tobak - the string crunches at Crazy New Beat, and we notice that the guys have learned something. And so it's off to the beat cellar with What'd I Say, Maybelline, Do Wah-Diddy-Diddy, Sick And Tired and a mercilessly good version of Memphis Tennessee. Klaus Gisha: "That was our best line-up, with Wewo came drummer Hans Bohländer from the same Hanau amateur band. They had to be notists." Heinz Reich flies, and so Wewo's prophecy that he would once again regret his lack of loyalty becomes reality. Heinz Reich: "Peiniger said that he would only come if Bohländer was allowed to come with him." Because a guitarist is urgently needed, the drum seat goes to the competitor. That's life. Sometimes you just meet twice. Reich then drums for ten years for the semi-professional rock band Frank & The Hurricanes, who are hard on Fats Domino and always carry a bunch of brass players around with them. Already with Reich and Rast the Gisha Brothers had been cavorting in the better houses and had performed there in association with orchestras like that of Hugo Strasser or Ambros Seelos - some of them catering for the rather conservative clientele, others the young savages. It was agreed that the musical discrepancy should not be too great. So the Gishas don't act too wild, although they also have Rolling-Stones songs in their program. While they still give instrumental titles like Yakety Sax, Charmer or Baby Elephant (where Hans Gisha is allowed to take the trombone out of the case) enough room for their performances, they also play their way through the beat-top-10. There is also a division of labour in the singing, Wolf-Werner Peiniger sings the fast stuff, Friedel Wüst the slow stuff, Klaus Gisha contributes the head voice, but Hans Gisha and Hans Bohländer are also active singers. The vocal passages are performed in immaculate English, something that is by no means a matter of course for German bands. They dare to make the arrangements - Klaus Gisha's area of responsibility - a bit more daring and to build in a saxophone passage for Can't Buy Me Love or Satisfaction. Peiniger may show with numbers like Wewo's Theme, Wewo's Rock or The Harry Lime Theme that he is only little inferior to Bob Bogle and Hank B. Marvin. Due to their musical competence and their ability to play from the sheet, the Gisha Brothers are the ideal partners to accompany stars - those who don't want to bring their own band with them or don't own one at all because it's too expensive. 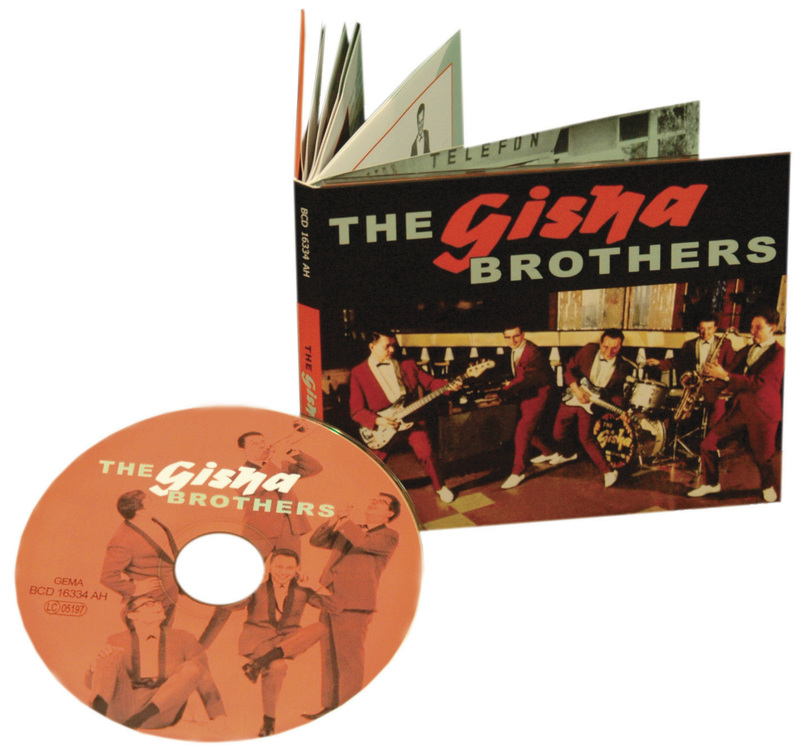 From Udo Jürgens to Ivan Rebroff to Josephine Baker, there are a number of illustrious names that the Gisha Brothers provide a musical background for. The professional manner, the pleasant appearance and the lovable manners ensure the band a place in the heart of the more sedate musicians. Finally a rock band that doesn't wear their hair felt over their eyes and smells unpleasantly like Beatkeller. It is therefore not surprising that they soon appear on the cinema screen with Uschi Glas and Roy Black and establish close ties with Hazy Osterwald. Our five gentlemen from Hanau are lined up single after single, but the success of Ringelingeling doesn't want to repeat itself - and when the CBS- responsible persons try one last double hit in 1966 (before they delete most of the German groups from their program), they do everything wrong. The pure instrumental LP 'Dance Party In Stereo' cut together to Medleys is not even suitable as a dance record, because it is absurdly underlaid with applause and seems inconsistent in itself. And also with the single you clearly bet on the wrong horse. Klaus Gisha: "'Cement Mixer' was not particularly successful. Hans Podehl spoiled it. I would have found the back better as the A-side, that's the stronger number." Never Let Me Go follows the paths of the Dave Clark Five and reminds us of songs like Whenever You're Around. And here is one last time how successful the Gisha Brothers could have been as a big beat band. In the same year, the band had to make a decision: either to focus on record productions or to go into lucrative long-term engagements in expensive nightclubs and hotels to play for a well-to-do audience. Klaus Gisha: "We didn't agree on that within the band at all. I then got the decision to commit to the engagements, and I think afterwards it was the right decision." So they say goodbye to the expensive winter sports resorts, in hotels like the 'Schloßhotel Velden', the 'Hotel Forsthaus' in Ruhpolding, the 'Hotel Post' in Davos or the 'Hotel Kulm' in Arosa. They are also welcome on cruise ships like the 'Tor Anglia'. When Hans Gisha's Gisha Brothers management changes over to Hazy Osterwald, they have to adjust to the Hazyland audience and can no longer be beat. In the Hazyland clubs they make themselves, after presentation of the notes, as a backing band of the big stars appearing there. In 1971, they disband and take up civic professions. Werner Bayer, Mathias Buck, Heinz Dietz, Klaus Gisha, Kurt Rast, Heinz Reich, Helmut Wenske. The Gisha Brothers hit single Ringelingeling is an original composition by Hans Gisha, although his brother Klaus, born on 21 July 1928 in Silesia, is the actual musical head of the group. The parents are Martha and Hans Gi?a, Professor of Music, active as music teachers and conductors of orchestras and choirs. After the annexation of Poland by National Socialist Germany, the name was changed to Gisha. Klaus and his brother Hans, three years his senior, receive top-quality musical education in their home musical household, and both will later begin successful music studies. In 1938 his father was appointed music school director and city orchestra director in Ohlau near Breslau. Shortly afterwards, a former private from Braunau decides to cover the world with blood and tears. Customer evaluation for "The Gisha Brothers"